In this article you can find some great external resources related to fonts. You will read about how to choose a typeface, how to combine fonts, how to choose the best font for headlines or for your logo, and more. At the end of the article you will find a few very interesting infographics and cheat sheets that everyone who is interested into typography should see. Choosing a typeface can be tricky. The beauty and complexity of type, combined with an inexhaustible supply of options to evaluate, can make your head spin. But don’t be baffled — and don’t despair. While there are no easy-to-follow rules on how best to choose a typeface, there are many tried-and-true principles you can quickly learn and apply to make an appropriate typeface choice. If you work systematically through the options below, you’ll have a winning typeface choice in no time. Let’s get started. Have you ever had the problem of not knowing what typeface to use? Well of course you have, everyone has. 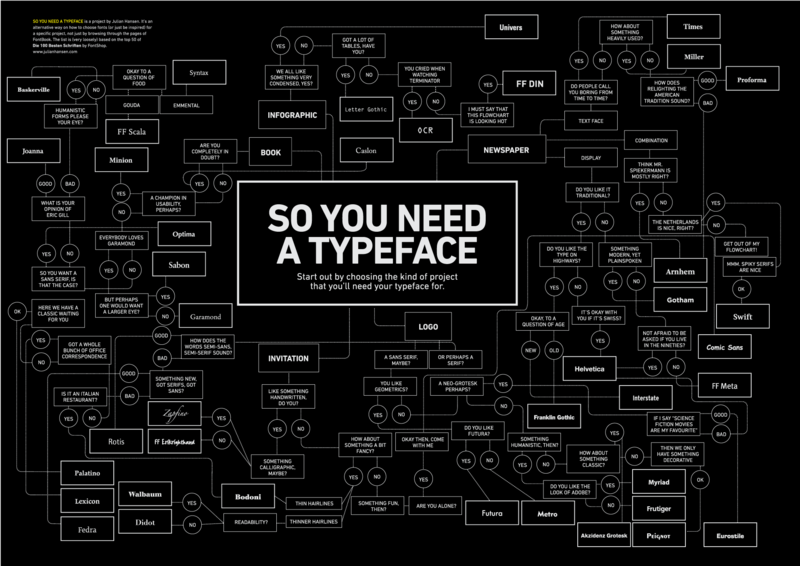 This is a guide on how to choose a font. Many people have asked me which text type is best for a magazine, a newspaper, a poster, a newsletter, a publication, etc. In general, I tell them which to use, but I know that this is not the best answer, because they won’t learn to do this by themselves. Today, I want to take time to analyze how to choose correct text typography design in different cases. It is very important to understand that these tips are not final word, but they can be good help at the moment of choosing a text type. In any case, it depends on what do you want to convey with this type, because many times legibility is as important as the character of the type. There are no absolutely right or wrong ways to choose fonts or mix different fonts in a design project. However, there are a few accepted standards that can speed up the font selection process and generally result in typographically attractive and readable compositions. Headlines and other short phrases or blocks of text are often set in display type sizes of 18 points and larger. While readability is still important, there is more leeway for using fun or decorative typefaces in headlines. Beyond what the headline says, it needs contrast — of size or font choice or color — to make it stand out. How many fonts are too many for one project and how do you know where to draw the line? A generally accepted practice is to limit the number of different typefaces to three or four. That doesn’t mean you can’t use more but be sure you have a good reason to do so. When it comes to making font combinations, there are principles and methods, but no absolutes. You can’t apply all the principles or ideas listed here at the same time. Just peruse this list of ideas and see what strikes you as interesting, and then pursue creating your own interesting typeface pairs! Typography is an huge field. People devote years of their lives to this ancient craft, and yet there’s always something new to learn. In this article, I’ll be reviewing the major points that you should consider when selecting a typeface for a website. Logos are always a hotly debated topic – more often than not because small business owners tend to place little importance on them and have a go themselves rather than use a designer.